For most of the last century the methodology of art history has followed a positivist approach, emphasizing form and style, fact and history as the means of studying works of art. By contrast the philosophical pursuit of truth, once central to the fine arts and humanities has largely been abandoned. In For The Love of Beauty, Arthur Pontynen offers a searching and ambitious critique of modern aesthetic practice that aims to restore the pursuit of the knowledge of reality--Being--to its rightful place. Pontynen begins by addressing the question of why the pursuit of truth (be it called Dao, Dharma, God, Logos, Ideal, etc.) is no longer acceptable in academic circles even though it has been intrinsic to the purpose of art at most times and in most cultures. Lacking the pursuit of truth, of some degree of knowledge of what is true and good, the humanities necessarily lack intellectual and cultural grounding and purpose. Fields of study such as philosophy, music, art, and history are therefore trivialized and brutalized. Pontynen's focus on the study of the visual arts details the how the denial of purpose and quality in modernist and postmodernist aesthetics has denied art any possibility of transcending entertainment, therapy, or propaganda. In place of the established narratives, Pontynen offers a counter-narrative based on a cross-cultural pursuit of the good, the true, and the beautiful. He recognizes that substantively different cultural traditions exist and that the truth claims of each may be valid in whole or in part. He shows how the history of art parallels the intellectual history of Western culture and how these parallels affect both aesthetics and ethics. Pontynen engages with those elements of modernist and postmodernist thought that might be true. His purpose is not simply to deny their validity but to engage a viewpoint that does not privilege the notion of a purposeless cosmos. 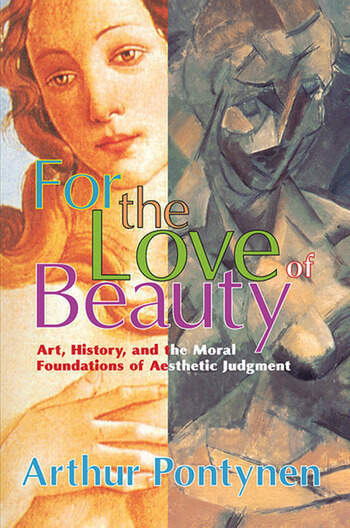 For the Love of Beauty will be of interest to art historians, students of aesthetics, ethics, and intellectual historians.